I'm a big proponent of 'off-rink' workouts. Stickhandling, passing and shooting are critical parts of the game and ones that I stress to my players that they must practice on their own. In the product review, I'll demo the Hockey Passing Kit from the team over at HockeyTrain.com. 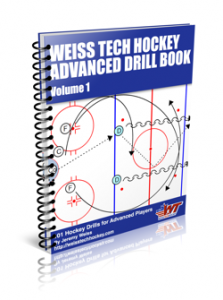 This is a valuable tool that will allow you to work on all these areas. I can personally attest to the difference they make. I received these in mid November and my 9 year old son started working out almost daily. The amount of comments he has received in the last few weeks about his puck handling and more notably his slapshot are a direct result of having the ability to work out off the rink. You may be thinking that I can already work out in the driveway or basement and you are correct. But the true advantage is that you get the true feel of being on the rink. Pucks aren't bouncing around and you aren't damaging your sticks by grinding them into the driveway. Trust me, it's worth it to have something like this as part of your workout.